Mark your calendars for the sixth annual Hearts for the Arts, a celebration party for supporters of public art in Hunt County. The event will be Saturday, Feb. 9, 2019 at the home of Byron Taylor. We have already raised enough funds to create two new murals in Greenville. The project proposals will be unveiled at the party on Feb. 9. 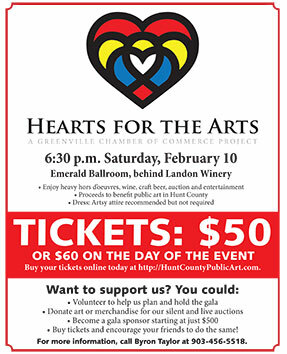 Click the image to download a flyer about Hearts for the Arts. Help us spread the word about it!